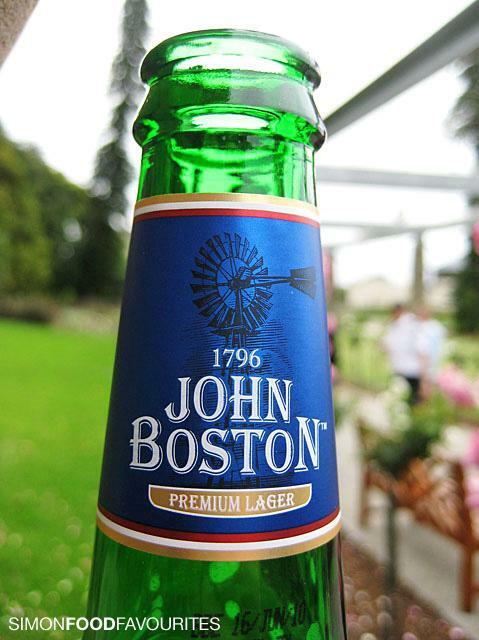 John Boston Premium Lager was launched on the Australian market in October 2009. Named after the free settler and republican John Boston who brewed his first beer in Sydney in 1796 it makes an alternative to Crown Lager which became available to the Australian people in 1954 to celebrate the coronation of Queen Elizabeth II. Now republicans have a beer to which they can toast the coming republic, writes Glenn A. Davies. 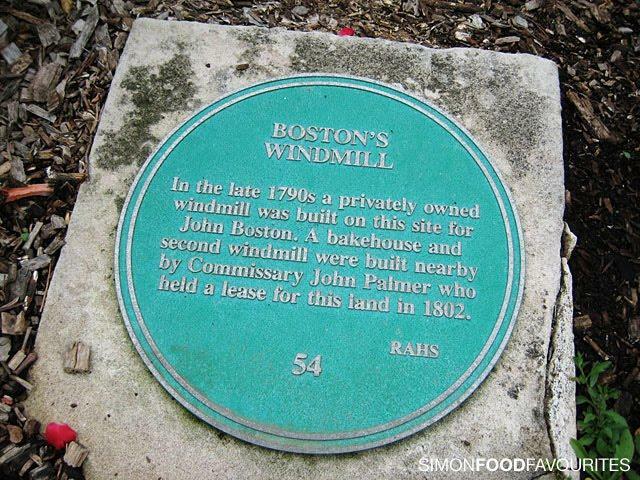 Located about 50 metres from the Rose Garden Pavilion is a plaque marking the actual spot where John Boston's original windmill stood which brewed the first beer in Sydney back in 1796. Boston was a republican, surgeon, apothecary, opportunist, schemer, salt-maker, trader and brewer who, with the aid of an encyclopaedia, found that he could make a form of beer from maize. As a young man John Boston hovered on the outskirts of the Birmingham circle of radicals and became a staunch republican. Perhaps because of his political opinions he decided to leave 'reactionary England' in 1793, and in December recommended himself to the Colonial Office as a trained surgeon and apothecary, versed in the arts of brewing and with 'theoretical and some practical knowledge of agriculture'. The secretary of state agreed to his going, hoped he would prove useful, and urged Governor John Hunter to keep him. He sailed with his wife and three children in the HMS Surprize which left Spithead on 2 May 1794 going via Rio de Janeiro to Sydney arriving on 25 October 1794. Before 1795, there had been little reason for concern about republican activity in New South Wales. However, with the arrival of HMS Surprize a change occurred within the political tenor of the colony. Onboard the HMS Surprize were the ‘Scottish Martyrs’, middle-class Scottish and English dissenters with a reform agenda. The ‘Scottish Martyrs’ had an influence over a number of the young men Governor Hunter had brought to the colony as his assistants. During the voyage the young Boston had been accused of toasting, “damnation to the King, his family, and all crowned heads”, and who had described himself as “an avowed Jacobin”. Boston was to continue his outspoken Jacobinism in the colony. In 1796, with the aid of an encyclopaedia, John Boston found that he could make beer brewed from properly malted Maize and bittered with the leaves and stalks of the Cape gooseberry. This was so successful that by September he had “erected at some expense a building proper for the business”, was making soap, was granted 170 acres at Mulgrave Place, and had built a windmill to produce his beer which sold for 1s 6d each. No doubt the availability of beer would have been a godsend to the rum-soaked young colony. By late 1804, trade opportunities took Boston to Tonga where he received a warm welcome and was invited to a banquet. If the story is true, he was the main course. 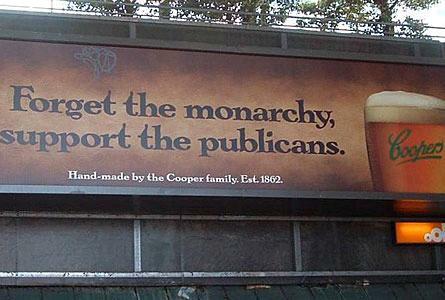 Another example of Australia's republican spirit bubbling to the surface occurred when Coopers Brewery was forced to drop a billboard ad in 2008 after it angered supporters of the Queen. The ad had an image of a frothy schooner of beer urging beer lovers to 'Forget the monarchy, support the publicans'. The billboard was believed to have been part of a national advertising campaign, but it was unknown how many of them were in use around Australia. Although the advertisement had received prior approval from the Advertising Standards Board, the cheerless teacup warriors from the Australian Monarchist League still wrote to the brewery with their concerns and the advertisement was withdrawn. “Initially on seeing it I thought that it might be humorous, but then I recognised that as people drive into the car park all they're going to see is 'forget the monarchy' “, Australian Monarchist League national chairman Phillip Benwell told AAP at the time. Benwell argued it was a political statement and felt that using the phrase crossed a boundary. Why not say “Forget the republicans”, he bleated. It was interesting that Cooper’s and its advertising agency seemed genuinely surprised that anyone would take offence at the billboard ad. Most Australians like a bit of humour and larrikinism in their politics. It is these cheerless monarchists who appear to be out of step with contemporary Australia. Benwell and his cheerless cohort appeared to be doing a King Canute and futilely commanding the republican tide not to come in. 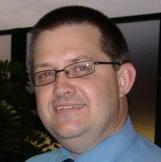 "Some people might think we are being a bit precious, but if we don't take a stand these things will continue", Benwell said. The absurdity of their demand to have a beer billboard removed can be heard in their shrill voices screeching "We are on the watch for these type of things". King Canute couldn't control nature and nor can Benwell dampen the roar from the coming republican tide. Today, John Boston's receipe for beer is 100% natural and with no preservatives or additives. So, let's all raise our glasses of beer and make the toast to "the coming republic".